MARCOM's "Lock-Out/Tag-Out" Regulatory Compliance Kit™ uses environments which are familiar to employees working with both electric and hydraulic/pneumatic equipment and points out specifically where Lock-Out/Tag-Out procedures should be applied. Created specifically to assist facilities in complying with the employee training requirements of OSHA's "Lock-Out/Tag-Out" regulation, this Kit discusses the OSHA Lock-Out/Tag-Out Standard, including the Energy Control Plan. 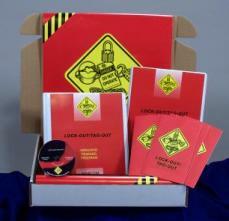 Materials in the kit include a video program, a compliance manual, five motivational posters, and 30 employee booklets. A compliance manual containing a "fill-in-the-blank" Energy Control Program, as well as other materials needed to help meet compliance requirements, is included. The posters in the kit emphasize the importance of working safely in Lock-Out/Tag-Out situations. The videotape and employee booklets include information on the regulation itself, "energized" machinery, lock-out/tag-out concepts and procedures, lock-out/tag-out devices, electrical systems, hydraulic and pneumatic systems, and more. The video program in the kit comes with a comprehensive leader's guide, reproducible scheduling & attendance form, employee quiz, training certificate and training log.